Babalwa Debele, age five, lives in a remote village in the Eastern Cape. The people live in huts and heat their washing water on an open fire. There is no electricity, not even in the seriously under-resourced clinics. The nearest hospital is about three hours' drive away by minibus taxi. The other problem of crocodile-like skin texture is down to the plastic surgeons. They make skin grafts go further by putting them through a device like a mangle. Especially with a child who can grow into a beautiful young woman, we urge them to consider ways to not make her arms unsightly for ever. Face and hands are used in daily interactions with other people but where possible, it is nice to maintain attractive arms and legs as well. When Mfundo Ntamehlo went to visit relatives in the same region of the country, Babalwa's family learnt about Children of Fire and how it could help children like her. We received this letter from her mother, a teacher: I am Nandiha Nosamkele Debele. I am the mother to Babalwa. 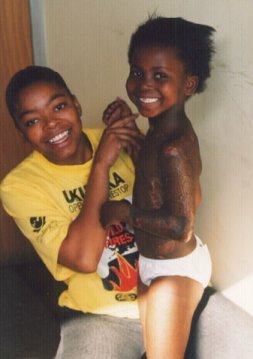 She was burnt by hot water on 29th August 1999. Her father's sister put a basin with hotwater near the bed in the bedroom, preparing to wash herself. Bablwa was on the bed at that time and she was playing. The aunt tried to take cold water in the bucket near her but before she did, Babalwa slipped and fell into the hot basin. She tried to take the little girl out of the house but it was difficult to get the clothes off quickly. I was away at that time dealing with a problem in Cape Town. The child was left with her grandmother, her aunt and two other children. They took her to the traditional healer who gave them medicine to put on the wounds. When I arrived home I found the child was not getting better but worse. We took her to the special doctor in Queenstown and the doctor sent us to the hospital in East London, and that was a free hospital. The doctors tried by all means to help the child but they said that the traditional medicine had made the wounds deep. 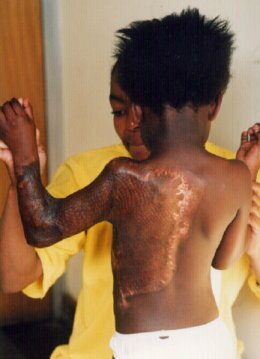 When they became better they took skin grafts and placed them on the burnt parts. The physiotherapist used to come some days to do exercises to the child and I also did it to the child so that her arm could become normal as it once was. But the doctor said that I must leave the hospital because the child is better. They discharged Babalwa but when she arrived home her arm was not fully stretched. After time it became worse like you see it now on the photo. Please help. This letter was written in August 2001 but we could not find any volunteer prepared to go into the remotest corners of the Eastern Cape and had no good medical contacts in the region either. The only solution was to ask the family to bring Babalwa to a city with good facilities. 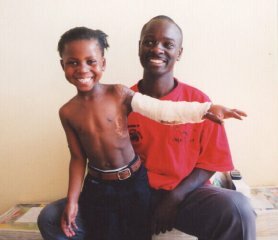 Babalwa came to Johannesburg in June 2002 and with a few miracles (like one day in a hospital diary entirely unbooked for operations by fortunate mistake), we arranged for her to have surgery to release severe contractures to her arm in July. On her first appointment she was accompanied by Elizabeth Botopela of the UMashesha as well as her aunt and Mfundo's mother Lina ... who is now also a member of the UMashesha volunteers. 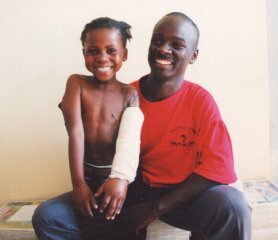 Babalwa had her arm contracture released on Wednesday July 24th and has a follow up operation on July 30th, 2002. The first operation was quite successful and three young pharmacy students who expressed an interest in helping the charity, went to visit her. Ada Li, Ananius Thiavhe and Shaldon Govender delivered her a doll, kokis (felt pens) and a new shirt to enjoy with her straightened arm, all gifts from the charity. Ada said: 'She was looking quite good but was very shy!' Babalwa can also only understand isiXhosa so it is difficult for people to talk to her unless they at least speak another Nguni group language. The problem of contractures is common with burns injuries. The grafted skin shrinks and prevents limbs from stretching to their full extent. It can be prevented with regular visits to occupational therapists and good splinting techniques. Sometimes the child needs to sleep with a thermoplastic splint Velcroed around the arm, for months. Maybe with the SA government's new plan for occupational therapists to have to give a year of community service before they qualify, then Babalwa-type problems will become less common... BUT there is no way that a child in remote village can see an occupational therapist once a week.. and without electricity, it is unlikely that trying to train rural nurses in the use of thermoplastic could be followed through either.